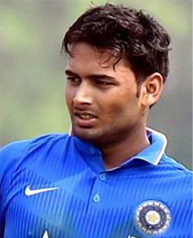 Rishabh Pant became the second youngest Indian wicketkeeper at the time of maiden Test hundred. Pant was 20 years 342 days old when he achieved this feat. Ajay Ratra is the youngest Indian wicketkeeper (20 years 150 days) to achieve this feat. This was also not only his first century in Test cricket but the also the first by an Indian wicketkeeper in England and Australia. And he is also the fourth Indian wicketkeeper to score a century outside Asia. Pant also become first batsman scores first run and first century in Test with a six.